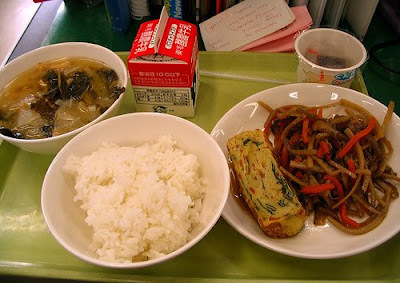 Contents: Japanese style omlette roll with vegetables, kinpira gobo, fermented soybean called `natto`, Rice, soup, milk. The writing on the milk and little cup is in Japanese. The egg thing is a Japanese style omlette roll with vegetables. Probably spinach and carrots in this case. The noodles are not noodles. It`s kinpira gobo. Julienned carrots and burdock root simmered in soy sauce and sesame oil. The little cup is a type of fermented soybean called `natto`. Usually mixed with mustard before being eaten with the rice.